You've probably seen images of the exotic, alluring king cobra swaying while a snake charmer plays the flute. But as intriguing as they are, king cobras don't make good pets. Not only is their venom extremely potent, but they have special dietary needs, they grow to formidable lengths, and they aren't legal in many places. King cobras are fascinating to watch and study -- but very dangerous to invite into your home. King cobras are native to Southeast Asia, India and South China. They can survive in a range of habitats including plantations, bamboo stands, mangrove swamps, plains and rain forests. They swim well and often live near water, and they climb trees. At up to 18 feet, king cobras are the world’s longest venomous snakes. They can lift the first third of their bodies into the air, looking humans in the eye. Usually they’re dangerous to people only if they feel threatened and can’t escape. However, when they defend themselves, they’re ferocious. Most king cobras’ fangs are less than half an inch long, but they’re potentially deadly. One bite can contain enough venom to kill 20 people, and these snakes strike with incredible speed and accuracy. Their venom contains neurotoxins that affect the circulatory, nervous and respiratory systems. A bite from a pet cobra can land you in the hospital -- or the morgue. Their fellow snakes are the main staple of the king cobras' diet. They eat both nonvenomous and venomous serpents, even other cobras. Occasionally they also dine on bird eggs, lizards, rodents and small mammals. Most states don’t allow king cobras as pets. Even in those that do, city and county statutes often prohibit venomous snakes. 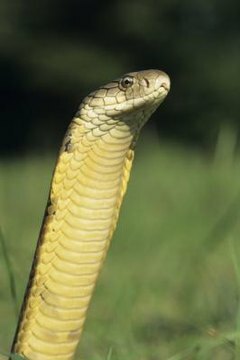 In some states, such as Florida, you may legally own a king cobra if you have an annual permit. To be approved, you must demonstrate that your snake is securely housed, and you have to follow state regulations about access, handling, inspection and travel. If you're caught with an illegal pet cobra, you could be fined and even imprisoned. The snake probably would be euthanized.